Plutella xylostella is a serious pest of brassicae and a threat to cabbage production in Ghana. Following complaints of farmers about the failure of insecticides to control the diamondback moth, we investigated the susceptibility of the diamondback moth to emamectin benzoate and lambda-cyhalothrin insecticides which are commonly used in the diamondback moth control in the greater region of Accra, Ghana. We also investigated the carboxylesterases levels in these populations of the Diamondback moth. 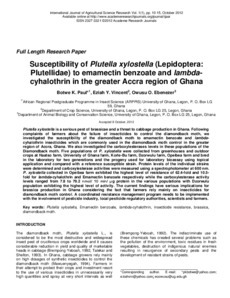 Five populations of P. xylostella were collected from greenhouses and outdoor crops at Haatso farm, University of Ghana farm, Korle-Bu farm, Dzorwulu farm, Opeibea farm and bred in the laboratory for two generations and the progeny used for laboratory bioassay using topical application and compared with a reference susceptible strain. Protein levels of the individual strains were determined and carboxylesterase activities were measured using a spectrophotometer at 600 nm. P. xylostella collected in Opeibea farm exhibited the highest level of resistance of 62.4-fold and 10.5-fold for lambda-cyhalothrin and Emamectin benzoate respectively while the carboxylesterase activity levels ranged from 7.8 to 79.2 nmol/ 10 min/ μg protein in the various populations with Dzorwulu population exhibiting the highest level of activity. The current findings have serious implications for brassica production in Ghana considering the fact that farmers rely mainly on insecticides for diamondback moth control. A coordinated resistance management program needs to be implemented with the involvement of pesticide industry, local pesticide regulatory authorities, scientists and farmers.